This record is a previously unheard masterpiece of Israeli multimedia artist Ami Shavit. As a professor of both philosophy and art and established kinetic artist in the 1970s Shavit was fascinated with new and interactive. technologies. While mostly focusing on visual art and mixed-media installations, a trip to New York in 1972 introduced him to synthesizers and triggered his curiosity to do some explorations into the world of music or "sound" as he preferred to call it. Ami's research was focused on the concept of meditative music that would help people to relax and create a cosy mood associated to the alpha brain waves and biofeedback. Before starting his artistic career, like all Israeli citizens, he had to serve in the army to his personal regret. Shavit had an operational position, which meant a high probability to get involved in a so called 'hot situation'. When in 1973 the Yom Kippur war broke out, Ami was enlisted again and got the unfortunate opportunity to encounter, in Hanoch Levin's words 'the dead'. Being an operation officer he was in charge of evacuating Israeli wounded officers from battlefields to hospitals. Some 6000 injured men passed through us during that war, he recalled one year later in a newspaper interview. 'I witnessed some sights that I can hardly forget. On the one hand I felt that as an artist I had to express the war events, on the other hand I felt that this is an almost impossible mission. Only Goya and Picasso, in his Guernica, addressed this topic successfully.' 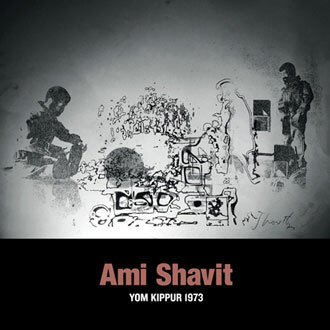 Yom Kippur is the final and seminal of Shavit's sound experiments ever recorded and now finally available to the world. We believe that this is an extraordinary strong piece in which the hectic moods and terrific experiences of war are deeply transmitted to the listener. May all soldiers, who are often forced to go through traumatic experiences beyond their own will, find ways to artistically digest and process the unwanted memories. Born in 1934 in Tel Aviv-Jaffa. Known as visual artist, his work involves in creating virtual environments with optic and kinetic art, including structures worked by electricity, moving tubular configurations illuminated by colored lights. He published In Alpha Mood in 1977 on Amis records, his own record company, at 500 copies, republished by Finders Keepers Records in 2015 and Neural Oscillations And Alpha Rhythms in 2018. Yom Kippur is his ultime recordings.